The Philadelphia Flyers announced that they have signed 5’9, 175-pound unrestricted free agent center Daniel Briere (bree-AIR) to new multiple-year contract, according General Manager Paul Holmgren. Per club policy, financial terms were not disclosed. “We are extremely pleased to add Daniel to our roster and eager to get him into our lineup,” said Holmgren in making the announcement. “We look for big things from him. Offensively, he is a player capable of doing a lot of good things. Judging by the 95 points that he scored in the league last year, we think that he is a very good offensive player and a great addition to our team." Briere, 29, recorded 32 goals and 63 assists for 95 points and 89 penalty minutes in 81 regular season games for the Buffalo Sabres last season. He led the Sabres in points (95, 10th in the NHL) and assists (63, seventh in the NHL). His 32 goals, 63 assists and 95 points were all new career highs for a single season. He led the Sabres in scoring with 15 points (3G,12A) in 16 playoff games as Buffalo advanced to the 2007 Eastern Conference Finals. His 12 assists during the 2007 Stanley Cup Playoffs set a new Sabres record for most assists in a playoff year. 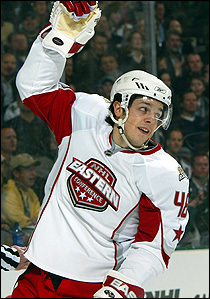 The Sabres’ co-captain was voted in as an Eastern Conference starter for the 2007 NHL All-Star Game, earning All-Star Game MVP honors after posting a game-high five points (1G,4A). Over parts of nine NHL seasons with the Phoenix Coyotes and Buffalo (1997-98 through 2006-07), Briere has registered 162 goals and 214 assists for 376 points and 365 penalty minutes in 483 regular season games. He was originally drafted by Phoenix in the first round (24th overall) of the 1996 NHL Entry Draft.